The modern profile of the Gulfton Collection paired with the natural look of wood, creates a unique offering for your contemporary bedroom. The walnut veneer with walnut finish is a bold statement to your decorative personality. Bronze finished hardware is mounted horizontally, in contrast to the vertical pattern of the wood’s veneer. 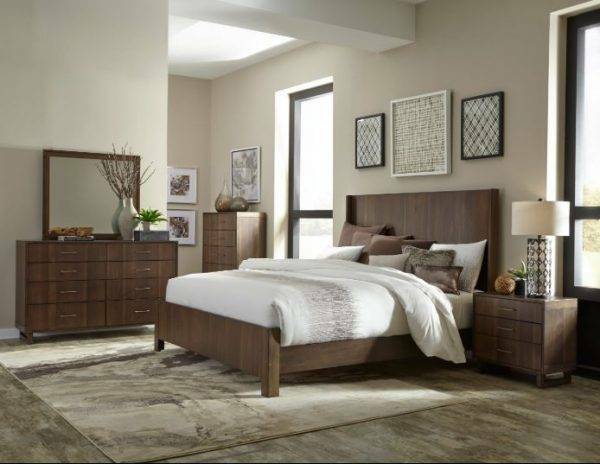 The flat panel bed and sleek lines of the case pieces further the modern styling.